The disciples stand before the high council (Acts 5:27-32). Council members remind the disciples that they were instructed not to each in Jesus' name. "But we have to!" they claim. They then rehearse Jesus' life story: his death, his resurrection, his position at the right hand of God. We have to, they say, because we were witnesses to all those things. We were witnesses...and so was the Holy Spirit (Acts 5:32). The Holy Spirit was a witness to the Crucifixion and the resurrection? That's a detail that may not be universally - at least universally artistically - acknowledged. A small, unscientific survey reveals that there are times and ways when a dove - arguably the most common symbol for the Holy Spirit - is shown in images of Christ on the cross. But the occurrence is far from the majority of times. (Left) Master of the Prayerbooks of c. 1500. 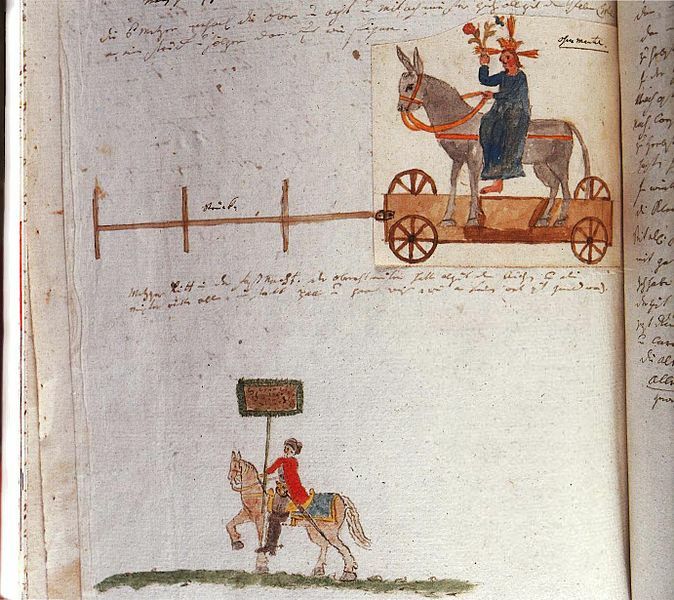 Royal 16F II, Fol. 89. London: British Library. 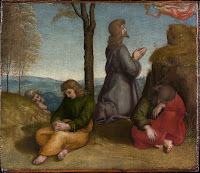 (Right) Masaccio. The Holy Trinity. 1425. Fresco. Santa Maria Novella, Florence, Italy. In the manuscript illumination (above left) the dove is flying in carrying an ampoule. An ampoule is a glass vial that can contain a substance - perhaps a liquid, maybe some kind of solid. The Holy Ampoule is a glass vial that held the anointing oil used at the coronation of French kings. In some medieval French images the Holy Spirit appears in scenes of baptism, bringing in an ampoule filled with oil to anoint the one being baptized. 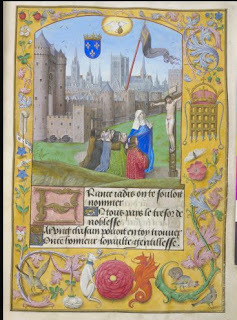 In this illumination, the dove is at the top center of the composition, hovering over the walled city of Paris (do you see Notre Dame?) 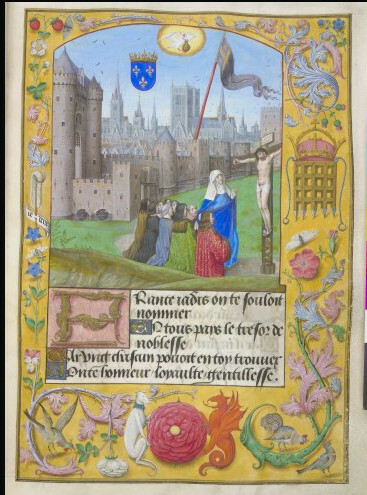 and a scene of Christ on a cross. Though identified as the Crucifixion, this also has the feel of travelers stopping at a roadside shrine that includes a crucifix. Shrine or crucifixion, this is one example where a symbol of the Holy Spirit is present. The Masaccio work (above right) is a theological diagram rather than a narrative illustration, so it does include all three persons of the Trinity, including a dove representing the Holy Spirit. The fresco, though, may not be an illustration of the apostles' claim before the High Council. And the other episodes - including the resurrection - seem to have even fewer evidences of the Holy Spirit. (only three chapters before this text) that they needed to make sure the Holy Spirit was highlighted? Why haven't artists picked up on that detail and included pictorial evidence of the Holy Spirit in their images of the crucifixion and the resurrection? Why might this be an important point to remember about the crucifixion and the resurrection? See how doves and disciples come together in a different work on this week's Art&Faith Matters on Facebook. We are as likely (possibly more likely) to see a pelican in crucifixion paintings than to see doves. For an example, see this 2018 post on Art&Faith Matters' Facebook page. For thoughts on John 20:19-31 - Thomas' post-Easter story, click here, here, or here. Praying in the Garden: Must Jesus Bear the Cross Alone? How alone was Jesus during Holy Week? Crowds lined the street as he rode into the city. Jesus did share a last meal with his disciples. The city was full of people even at the end of the week. And yet there were times he was alone. So alone. 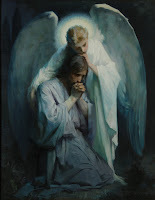 On the night he was betrayed, Jesus prayed, specifically in the garden of Gethsemane according to Matthew (Matthew 26:36-46) and Mark (Mark 14:32-42), on the Mount of Olives according to Luke (Luke 22:40-46). He takes several disciples with him, but they fall asleep...more than once. Could you not keep awake one hour? he asks them. He prayed alone. But according to Luke's gospel there was a presence who appeared to give Jesus strength in that agonizing hour. In the NRSV, Luke 22:43 says, "Then an angel from heaven appeared to him and gave him strength." The KJV says, " And there appeared an angel unto him from heaven, strengthening him." What does it look like when an angel appears to strengthen Jesus? In Raphael's version below, the angel hovers above Jesus carrying the cup from which Jesus prays to be spared. 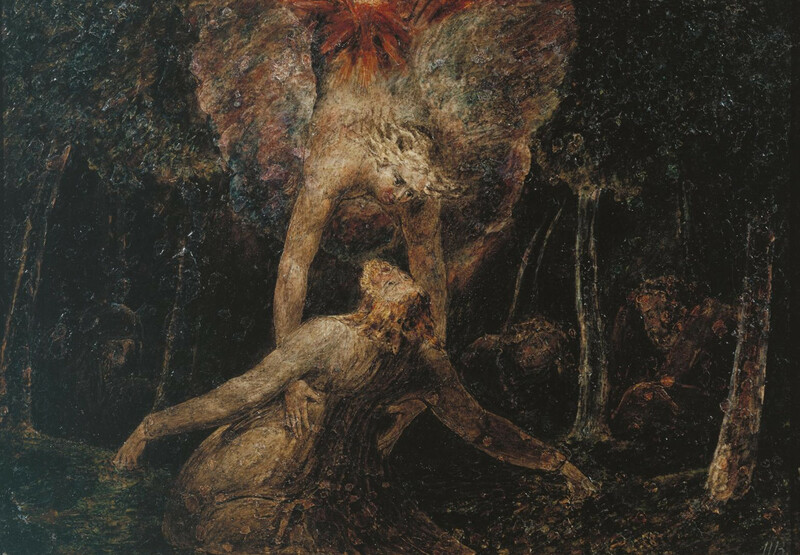 A couple of centuries later, William Blake's angel literally supports Jesus, whose fervent prayers have rendered him unable to stay upright on his own. Another century later, Frans Schwartz's angel stands beside Jesus with an arm around his shoulders. (Left) Raphael. The Agony in the Garden. c. 1504. NY: Metropolitan Museum of Art. (Center) William Blake. The Agony in the Garden. c. 1799-1800. London: Tate. (Right) Frans Schwartz. The Agony in the Garden. 1898. Salt Lake City, UT: Brigham Young University Museum of Art. From his entry into Jerusalem on through Holy Week, Jesus is alone in the midst of a crowd. The cheers of the entry parade will become calls for his death. His disciples will fall asleep while he is praying. One of his closest friends will betray him. He will be crucified, and his followers will deny him, fall away, or watch from a distance. It's only natural that we would want to make Jesus a little less alone. Artists do it, and even scripture interpreters do. In The Message, Luke 22:43 reads, "At once an angel from heaven was at his side, strengthening him." At his side. I hope so. Another thought on Jesus' aloneness is on this week's Art&Faith Matters' Facebook page. For thoughts on the footwashing of Maundy Thursday, click here. If you want to re-enact Jesus' entry into Jerusalem, you'll need a few things. Some people wearing cloaks...so they can take them off and lay them on the road. Some palm branches (well, maybe...see this week's Facebook post for more on that). Jesus on a donkey. Fortunately, German sculptural tradition provided the last through a form called a palmesel (palm donkey). 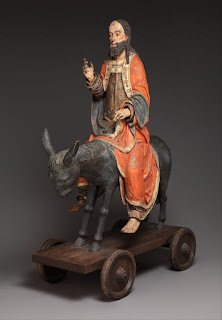 The figure of Jesus, usually about half life-size, is seated on the donkey, and the sculptural group is on a wheeled platform pulled through a town or city as part of Palm Sunday processions. Townspeople spread their cloaks, along with palm branches, on the ground before the Palmesel. Just like they did in the gospel accounts. (Left) Dominikus Debler. Der Palmesel Debler IX, 491 (S. 113). c. 1800. 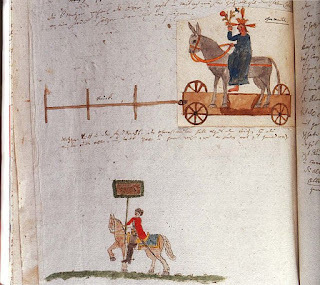 Die Chronik des Dominikus Debler. 1756-1836. Schwäbisch Gmünd. (right) Palmesel. 15th century. 61 1/2 x 23 3/4 x 54 1/2 in.NY: Metropolitan Museum of Art (Cloisters Collection). You can see a short film about a contemporary Palm Sunday procession through two towns in Austria that incorporates a palmesel here. 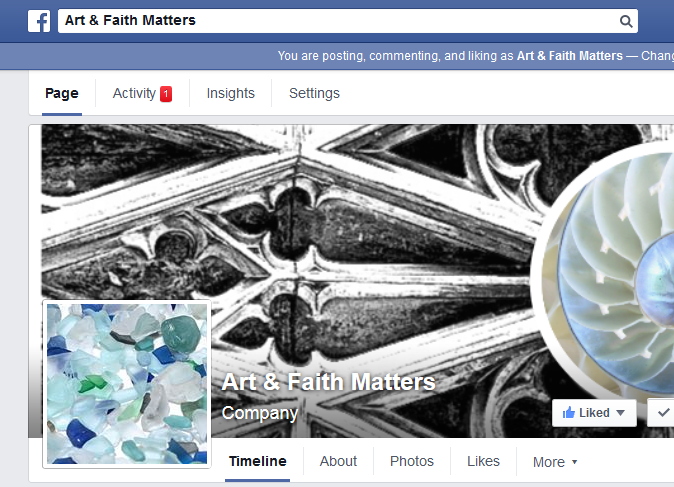 This week on Art&Faith Matters on Facebook, one more thing you need for a re-enactment of Jesus' triumphal entry into Jerusalem. For Matthew 21:1-11, click here. For Palm/Passion Sunday, click here.